Each Chromatin Assembly Kit contains reagents for 20 reactions. A reaction is defined as chromatin generated from 1 ug of DNA. In eukaryotic cells DNA is associated with histones to form chromatin. The basic unit of chromatin is the nucleosome consisting of 146 bp of DNA wrapped around an octamer of the four core histones H2A, H2B, H3 and H4. Chromatin assembly is a fundamental process that is tightly linked to DNA replication and enables the cell to faithfully duplicate the chromosomes. Chromatin assembly can also occur independently of replication to turn-over histones, for instance during transcription or DNA damage repair. The chromatin-remodeling factor ACF (Acf1/ISWI complex) cooperates with the histone chaperone NAP-1 to assemble, in vitro, a regularly spaced chromatin in an ATP-dependent manner. The Chromatin Assembly Kit allows you to assemble chromatin on you favorit DNA sequence. The kit generates assembled chromatin in less than 6 hours with few manipulations, providing you with material that is ideal for downstream applications such as in vitro transcription, recombination, replication assays, histone modifications analysis and in vitro ChIP assays. The kit contains recombinant human histones, the recombinant histone chaperone NAP-1 and the recombinant Acf1/ISWI complex, which catalyzes the deposition of histones into a regulary spaced nucleosome arrays in an ATP-dependent manner. MNase digestion kinetic of chromatin assembled on supercoiled DNA using the Chromatin Assembly Kit protocol. 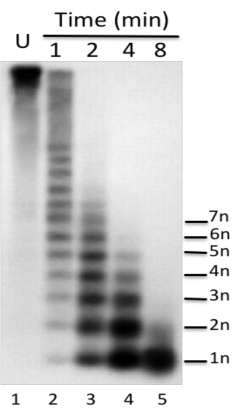 Regulary spaced nucleosomes are visualized on agarose gel and labeled from 1 to 7n. Lane 1: Undigested DNA; Lane 2: Circular DNA digested with MNase for 1 minute; Lane 3: Circular DNA digested with MNase for 2 minutes; Lane 4: Circular DNA digested with MNase for 4 minutes; Lane 5: Circular DNA digested with MNase for 8 minutes. The chromatin assembly kit should be stored at -80°C. Avoid multiple freeze-thaw cycles. For research use only. Each lot has been evaluated by SDS-PAGE and tested for chromatin assembly. Products guaranteed stable for six month from date of receipt when stored properly.